Now that the Easter Bunny has come and all the eggs have been dyed, you are likely wondering what to do with those leftover eggs you and your little ones delighted in coloring. The fun doesn’t have to end just because Easter is over … we’ve got lots of ideas for your leftover eggs and supplies! This is my beloved aunt’s recipe. She brought her famous deviled eggs to every family function. From baby showers to graduation parties, you could always count on her deviled eggs to be there. The texture of the yolk was velvety and smooth, and always seasoned to perfection. I hope you enjoy them as much as my family! Place eggs in a large pot. Cover with water, so that there is about 2 inches above the eggs. Heat on high until the water boils, cover pot and continue boiling for one minute. Remove eggs from heat and set aside for 15 minutes. Place eggs in cold water for about 1-2 minutes. Carefully peel eggs while still warm. Peeling under running water helps with sticky shells. Dry with paper towels. Slice eggs lengthwise and place on a tray. Scoop out the yolks and place in a separate bowl. Finely mash the yolks, then add the remaining ingredients. Place yolk mixture into a frosting bag, and pipe evenly to refill the whites. If desired, top with olive slices or bacon bits, and sprinkle with paprika. Keep refrigerated until ready to serve. I admit it. I love eggs. A sandwich made of nothing but their yummy goodness is one of my favorite treats. Check out this recipe from allrecipes.com for an easy lunch! You can use it as a sandwich or on top of a bed of lettuce or arugula. I add either fresh dill, green olives, or dill pickles to mine. Divine! I way overbuy egg dying supplies. I always have leftovers every year. There is no need to despair, those dye tablets need not go to waste! My favorite thing to do with leftover egg dye is to simply add water to it to make liquid watercolors, then let the kids go to town painting! Store-bought liquid watercolors can be a bit pricey, and this is a great up-cycled alternative! Another fun project is to use the watercolors to dye coffee filters to make tissue paper flowers. You can read a how-to from Aunt Peaches linked here. This page calls for tulips, but you can simply just fold a dried, dyed coffee filter into ⅛-ths and scallop the ends, then unfold and stack a few on top of each other to create your flowers. Super easy and fun for kids! 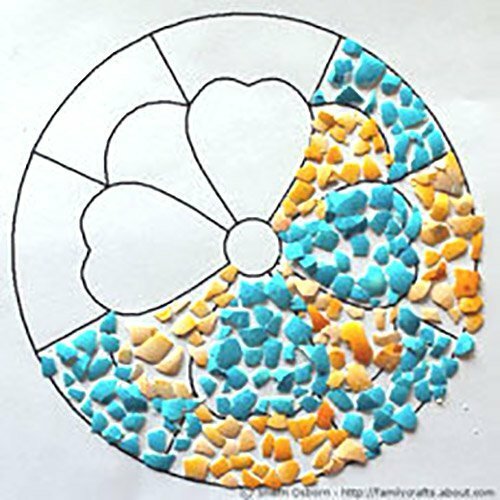 Check out the familycrafts.about.com website for this crafty way to use up your leftover colored eggshells. You can make any design you like! This is definitely on my to-do list with my 9 and 12 year olds. What a great way to spend an afternoon! Have fun with your leftover eggs and supplies! P.S. – For even more kid-friendly projects visit CMSECT’s”Artwork” Pinterest board. Sarah B. has posted a wonderful collection!